Joe Humfrey, art and code director at game development studio Inkle, believes that the primary goal in designing text for video games is “making sure every word is effortless to read.” It turns out that making sure players can read and understand on-screen text is a more complicated task than you might think. You might not spend a lot of time actively thinking about fonts, how to design text or user interfaces, but they significantly impact how a you interact with a game. In fact, you’ve probably recognized and struggled with one form of badly-designed text that’s common in a lot games: really small subtitles. “I could probably rant for an hour about how most console games have tiny tiny text, probably because the developers sit right next to their TVs so don’t care. Please don’t do that,” Humfrey said in a recent GDC talk. It might be the layout of a book, well composed subtitles, a clean user interface, or a good logo—these are all part of a whole that create a less frustrating and fuller experience for players. Designing type for games isn’t just about user interfaces, though. Every sign and fake logo you see in a game was made by someone. Chung pointed out that players are often pretty savvy at recognizing this kind of text design when it looks wrong. When a game nails type design, it makes the game more cohesive. It might be the layout of a book, well composed subtitles, a clean user interface, or a good logo—these are all part of a whole that create a less frustrating and fuller experience for players. Chung told me about a carpet in Event that he spent a number of minutes looking at from every angle. It’s a fluffy shag carpet with the logo of the company that you’re in. “Part of it is building rules for how you’re using text,” Chung said. “Like, is this game going to put critical information in the text? Or is the text more incidental and fun and skippable? Does the game have some way of demarcating between different uses of text?” Once those conventions are established, players adjust to them quickly, but it’s still necessary to not make text that’s a chore to read. Humfrey said in his recent GDC talk that the two to keys effortless reading are focus and pacing. “I like to think of focus and pacing like harmony and melody,” he said.”Focus is like harmony—beautiful typography in a single moment. Whereas pacing is like melody—how the story flow is presented over time, as a sequence.” 80 Days is a good example of both these ideas in practice. Each line of text is spaced so that individual sentences and paragraphs are shown in readable chunks. 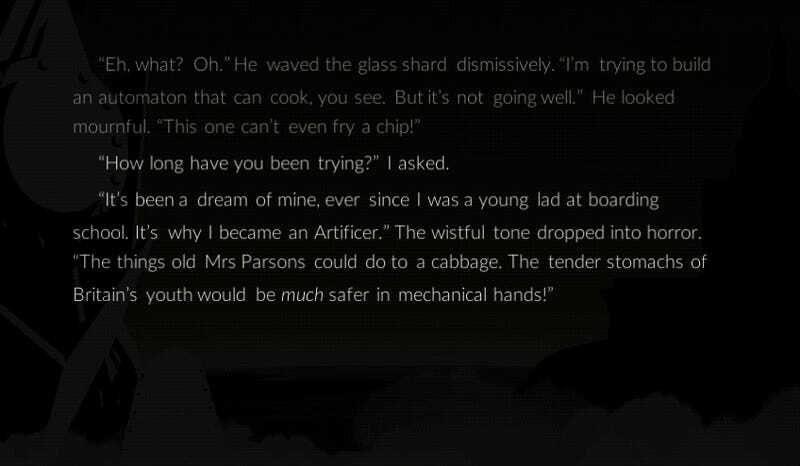 As players click or tap through story choices, the new text animates onto the screen fast enough that the player isn’t waiting, but also slowly enough so that they can read it. Legibility and readability are also important. Legibility is the ability to make out the individual letters, while readability is the quality that makes your eyes fly over the text with full understanding of its contents. These two are related, but not exactly the same. 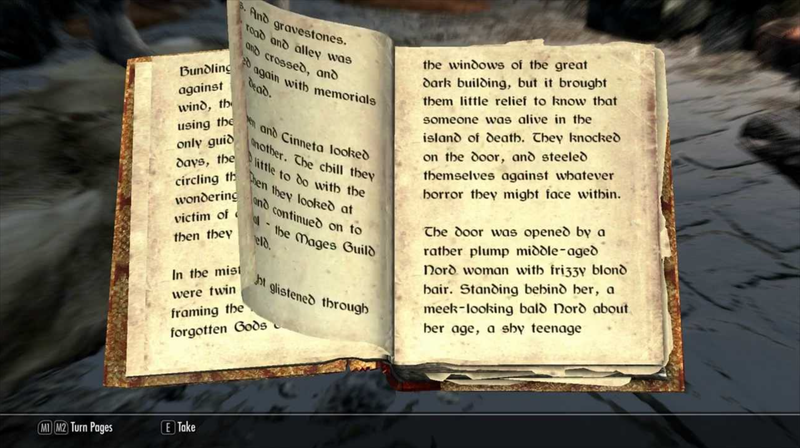 In Humfrey’s GDC talk, he used the books in the Elder Scrolls games as an example, in particular a book from Oblivion. The font developer Bethesda uses is appropriate to Oblivion’s world. It looks sufficiently medieval, and while it has a lot of flourishes, it’s legible, meaning each letter is distinct from each other. But it isn’t readable, meaning that the books take more time to for players to read. Humfrey demonstrated how he would improve it: in his talk, he changed the font to a variant of Calson, a typeface that originates in the 18th century, and put fewer words on the page. He also increased the spacing between the lines and made the margins bigger. These small changes made for a more readable page. The original book appears on the right, and Humfrey’s suggested changes appear on the left. Humfrey pointed to the BBC’s subtitle guidelines as something that game developers should aim for when it comes to designer better subtitles, but also said that even cheap DVDs do a better job at subtitles than most games. “While the font may not always be pretty, it’s the right size, and they split larger quantities of text across multiple timed sections, allowing a smaller quantity of larger text, and preventing the eye from getting lost while reading,” he said. Those principles can be applied across different ways of designing type and user interfaces. Correction, 2:30pm: A previous version of this article misspelled Joe Humfrey’s name. Additionally, the quote starting, “Just as you don’t judge books by covers,” was misattributed to Brendon Chung instead of Humfrey.